The 2019 International Centre for Academic Integrity Conference took place in New Orleans in March 2019. The conference saw more than 250 attendees come together to talk about academic integrity. More than half of the attendees were at an ICAI event for the first time, showing how important this area of work has become. I have been to international ICAI events before, but this was my first ICAI conference in the United States. The conference also brought with it massive interest in contract cheating. There were up to six parallel presentations taking place at the same time, but in most of these timeslots at least one presentations was devoted to contract cheating. As you’d expect I primarily attended the contract cheating sessions, but did get to a few others, so got a good idea of the main themes being discussed at the conference. With presentations running to 45 minutes each, these was a lot of information about contract cheating presented. This include my well-attended contract cheating presentation on the first day (and I also summarised the presentation in a post about this contract cheating presentation for the ICAI blog). Several retrospectives of the conference have been published, including these from Tricia Bertram Gallant and Jonathan Bailey of Plagiarism Today. 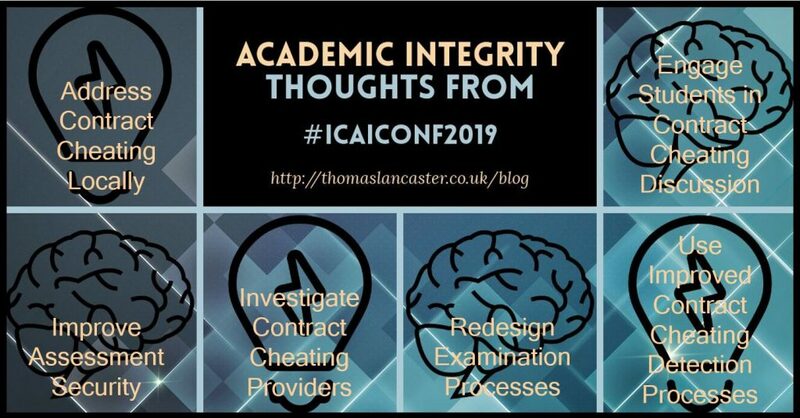 As I usually do, I tweeted many of the interesting findings with the Twitter hashtag #ICAIConf2019. In this post, I want to bring together six of the themes I identified which I hope will be of wider interest. Before the conference, it seemed that few people in the United States were talking about contract cheating. I know we got through to the people who attended ICAI 2019 and I hope to see more work emerging in this area, but there is still a long way to go. It seems strange to say this, but I think that several of the contract cheating presentations were more advanced than what was helpful for the audience. There’s still a need for exposure of the problem and a level of basic information. US higher education also has its own unique operational quirks. That means that processes from one part of the world don’t automatically work smoothly if you try and to transpose them to somewhere else. We need more data at national level, as well as plans to address contract cheating. Some people are collecting national level data. During the conference, we found out that 28% of students in Ukraine thought that contract cheating could be acceptable, depending on the professor and the situation. Veronika Kralikova also presented on the Global Essay Mills research project, which has been collecting student views on contract cheating from different countries. Unfortunately, Veronika also that the survey used had had a major flaw, as one third of people starting it did not complete, mainly due to a question asking about their personal contract cheating habits. This shows the need for careful survey design, but also demonstrates the value of talking openly about both successes and failures so that other researchers do not make the same mistake. Work in Canada, led by Sarah Eaton from the University of Calgary, found that contract cheating was not commonly mentioned in Canadian university academic integrity policies. Even where this was mentioned, the definitions used were inconsistent. Another useful research project would be to replicate this work on integrity policies for other parts of the world. Many students arriving at university are technologically savvy. This can include students from all disciplines, not just those on engineering and computing courses. We’ve heard many times about students who are able to hack into university systems to obtain information, change marks or gain an advantage. The University of Maryland University College (UMUC) reported that some students were obtaining their exam questions ahead of exams, with advance papers typically changing hands for $350 USD each time. Despite these risks, the cybersecurity in place in schools and universities is often weak. For example, I found out that some places simply set up one shared Turnitin account, then circulate the username and password for this single account for all students to use. Those login details then become available outside the organisation, perhaps explaining, for example, how essay mills claim to be able to run the assignments they do for students through Turnitin to prove that they are original. A risk that comes from not ensuring that only the correct people have access to university online systems was also shared. Several contract cheating services now claim they will complete a whole online course for a student. They just need the login details for those students. These cheating services have been observed then using those login details to send spam messages to other students on the course, helping to multiply the reach of their business. Firms were also saving copies of as many teaching resources as possible to make them available for sale elsewhere. UMUC are working on an artificial intelligence based web crawler to find when their teaching materials have been posted online without permission, a tool which may be useful for other universities looking to protect their intellectual property. As a Computer Scientist, I know that the poorest part of many security processes is the human element. Many otherwise good processes are vulnerable to flawed procedures or social engineering. Another example given at ICAI 2019 mentioned the problem of academics leaving exam questions visible on their computer screen, even when they had stepped away from it. Students do not always value their personal data. Many are used to giving their email address to anyone who asks, or expect that all the advertising they see online will be personalised to them. Discussions about the importance of personal cybersecurity are necessary with all types of students. Knowing more about the firms and writers behind contract cheating services was an area I pushed during my presentation. I was happy to hear that another delegate was working on her PhD speaking to the writers behind contract cheating services, even though she said that writers were suspicious about her reasons for wanting to interview them. Many writers are in this line or work simply because they want (or need) the money involved. I noticed one writer from Kenya tweeting a link to my conference presentation slides and using that as evidence that essay service writers were being exploited. Providers were found to be using increasingly cunning techniques to get students interested in their services. One concerning example given related to firms setting up groups on services such as WhatsApp and WeChat aimed at new students at a particular university. These were initially presented as friendship groups, with the firms taking the time to get to know the students, seemingly being interesting in their well-being and their progress. When the firms realised the student faced a deadline and was finding things hard going, they would throw out an offer to provide a contract cheating service. With the rapport and friendship in place, the student would be much more likely to take up that offer. Physical adverts also appear regularly in many universities. Tricia Bertram Gallant mentioned a new technique which she had been using to address posters for contract cheating services. 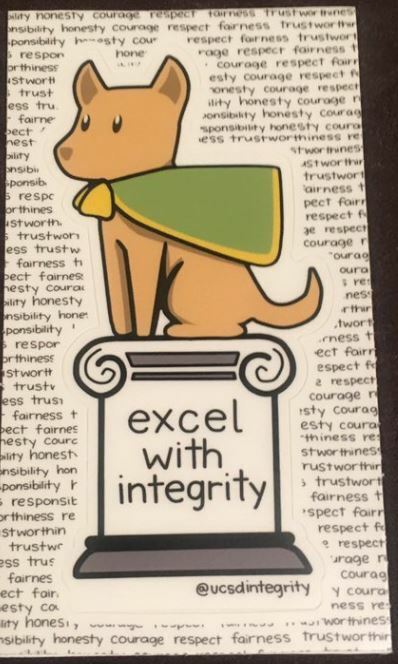 Rather than taking these down, where they would be replaced, they were now having stickers put on them reminding students that they should not engage in academic integrity breaching behaviour using these services. When exam papers are badly written, or exams are not properly secured, the whole assessment process becomes vulnerable. Students can be sucked into cheating even if they did not originally intend to do so. This was illustrated by the moving conference keynote presentation by Lewis Sims. Lewis discussed how his life had been turned upside down while he was training to be an officer in the US Navy. One of the other candidates got hold of the answer key to an upcoming exam, Lewis got hold of a copy, used it and ended up without a naval career. More than 20 years later, Lewis had turned his life around, was teaching sport and warning students not to make the same mistakes that he had. The problem of reused questions was discussed. In Ukraine, books with answer keys to exams were said to be easily available for purchase. That is little different to sites like Course Hero elsewhere, where students supply questions and answers that they’re aware of, with the crowd sourced solution building a large repository of otherwise private course information over time. Some would argue that this is little different to the information US fraternities had always collected. Many academics were said to be totally unaware that online versions of such services existed. As long as academics keep using the same questions (something heavily discouraged in the contract cheating literature), students who choose to cheat can have an easy life. I already knew about the problem of questions being shared when the same test is taken multiple times in a day. This is easy to do with a hidden camera. But for the first time I heard about the related problem of a photographic memory, where someone can take an early test then accurately reconstruct the questions for everyone taking it later in the day. The importance of robust processes being in place during exams was also mentioned. UNSW Sydney showed the forms they use to record when students visit the bathroom, very useful for getting timings as evidence for exam integrity breaches, or identifying students who are using the bathroom more than would be expected. This provides an extra layer of protection when a student could easily access notes or technology in the relatively private surroundings of a cubicle. The artificial intelligence techniques used to work with big data were being shown to be useful to detect contract cheating, particularly for courses for which the entirety (or a large proportion of) was taught online. UMUC presented their elaborate plans to ensure integrity using multiple techniques, including employing working with a firm to use the same fraud detection techniques as banking in their systems. This was seen as potentially being a good way to disrupt the contract cheating industry worth hundreds of millions of dollars per year. Systems looking at stylometric analysis, automatically tracking that student writing style is consistent from assignment to assignment, are beginning to emerge. UMUC also said that they planned to use these same systems for all written contributions going through the system, including forum posts. Developing corpora beyond just student essays and assignments is something I’ve recommended before and it will useful to track how closely forum writing style matches that students use for formal written assessments. IP tracking was also proving successful. UNSW Sydney shared several examples of how they had used IP tracking within their systems to identify large contract cheating rings (sometimes involving more than 100 students at a time) These included multiple students who had hired the same contractor, who was logging into their accounts from the same IP address. They also included unusual account access patterns, such as seeing students using their accounts at times when this should not have been possible, such as during an exam. Often, we think that students should be interested in academic integrity because we are, or that they should just “know” what is right and wrong. There is promising work going on where academics engage closely with students as partners on the subjects of contract cheating and academic integrity. This is progress that we can learn from. Some universities have been developing their own academic integrity modules, often online. One example I saw was the University of Central Florida, who used video and discussion activities to show students what the consequences of plagiarism would be (including the interesting solution of banning students from representing the university for a set period, which must be a threat worth considering to get through to those on the sports teams). Commercial companies have also been working on academic integrity education solutions which universities can subscribe to (for example, the Epigeum academic integrity course which I have been part of the writing team for and which takes more of a values driven approach to academic integrity). Karen Gardiner from the University of Alabama discussed an interesting approach to teaching academic writing. Here students are required to research a member of their family from a few generations back and write about them. I saw a few potential ethical issues, for instance what if this led to a student finding out their parents are not who they thought they were or that a sibling they were unaware of had been given up for adoption, but apparently such concerns are not an issue in Alabama. What did shine through was Karen’s passion for the subject; such eductaor assion has to be one of the best ways to get students engaged with any subject. I was also impressed by Jonathan Bailey’s talk about plagiarism issues appearing in popular culture. Jonathan shared examples of how plagiarism had been discussed on TV shows back to the 1950s. He mentioned a repeated similar plot about obscure poems being submitted as if written by the student. The most interesting example of pop culture plagiarism came from the cartoon show Arthur, where a student was required to write a five page essay with a short deadline over a holiday, with the expected result of the student finding another solution. It just shows how important sensible assessment design, including considering scheduling, is in helping students to avoid breaches of academic integrity. One of the most interesting sessions of the ICAI 2019 conference was presented early on. Evangeline Litsa Mourelatos and Tricia Bertram Gallant looked at how well different student activities forming part of the International Day of Action against Contract Cheating had worked. They stressed the need for activity to be visible both on campus and externally. This is to show the power of academic integrity awareness and to get the media interested. It is worth thinking outside the box in this area and using the power of the student voice to come up with new ideas. Some of the most successful approaches included developing videos, using keynote speakers, giving out stickers and getting students to engage in visible pledges – ideally taking a copy of their pledge away with them. 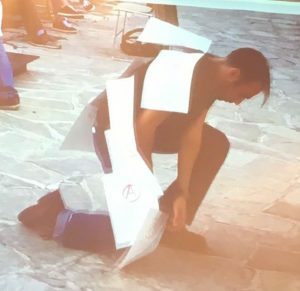 One of the most innovative ideas involved getting students actors to present contract cheating scenarios in different ways. Graffiti walls had also been used to create a visible and memorable discussion of contract cheating, but these came with a warning, one of these walls had been left unsupervised for a while and ended up covered with messages rather different to those intended. I strongly recommend attended academic integrity events to get involved with the community of educators involved in this area. There are always good ideas being shared and it is so exciting to see the positive progress that continues to be made. I leave you with a tweet from Tricia Bertram Gallant capturing the end of my presentation. I think this nicely sums up my thoughts of where we need to go next as a community of academic integrity educators. I’m currently a member of the QAA expert group that is creating guidance on academic integrity for the UK higher education sector. The QAA has been doing much excellent work in this area stemming from their previous work on contract cheating. In order to help to develop and share good practice, they have recently launched a pilot project on academic integrity as part of their enhancing partnerships work. For this project, teams from different UK universities will meet regularly over the course of a year to develop their academic integrity practice. I presented the keynote at their first meeting, bringing together many of the latest findings and open questions in this field. Academic integrity will continue to offer challenges. During the presentation, I tried to remove the idea that many seem to have that academic integrity just relates to a “battle” where we try to stop students from cheating. The metaphor does not work for me and there are so many more aspects that we have to think about. I promoted the idea that universities should use their students as part of their academic integrity working group. They, after all, have a vested interest in the results of assessment. I will be following the remaining of the pilot project with interest to see if many of the universities taking part adopted that approach. Much attention has been paid in the UK to the petition aiming to ban the advertising and provision of essay mill services. This says that you can buy a PhD for £6,750, a figure which has been floating around the media for some time. But, is it really possible to buy a PhD online and for a price similar to this? You can definitely buy PhD level writing. And a student who is familiar with how the essay industry works can find a better value PhD thesis than that offered by a typical essay mill. How Do You Go About Buying A PhD? You can, of course, buy a fake PhD certificate, or use your “life experience” to get a qualification from a fake university. But such qualifications are unlikely to stand up to external scrutiny. You might try and make connections directly with a writer and work with them. But I suspect most people will see the type of advertising for PhD mills that appears when you search on Google. It’s hard to avoid it, as even a prospective student looking for advice about which university to study a PhD at will be hit with ads of this type. 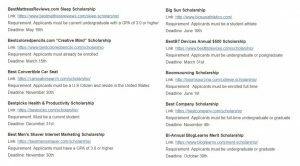 The advertising for PhD writing services is nowhere near as advanced as for essay mills but many of the same marketing techniques are in use. You see guarantees, discounts, promises of fast turnaround times and the old favourite of “0% plagiarism“. But, with my marketing hat on, I think you can also tell that these services don’t really understand the prospective PhD market – although I’m not about to provide free consultancy for here to help them improve. The less developed market for PhD writing services is also reflected in the cost per click prices charged by Google (the amount each advertiser pays every time someone clicks on the link). Advertising for PhD mills is generally cheap. There are some high value keywords. For instance, Google in the UK suggests that advertisers bid between £11.22 and £20.49 per click for the search term “phd thesis” to get at the top of the first screen (the only position that really counts). But many terms go for much less. A search term like “buy phd online” only requires a cost per click between £1.15 and £4.92. These costs are usually far lower than the equivalent terms for essays, coursework and assignments. How Much Does A PhD Thesis Cost? The web market for buying PhD level work is nowhere near as advanced as equivalent essay mills for undergraduate level. 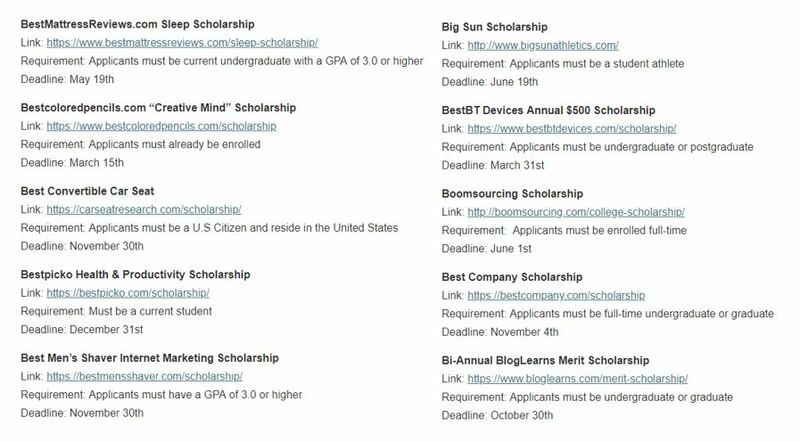 Many of the essay mills I checked advertise they will write PhDs, but do not have any detail or pricing information available on their website. I did find a site which sold PhD by chapters. A 75,000 word PhD thesis would cost around £6,000, not far from the headline figure used at the start of this post. However, the site also advertised having coupons available and I suspect I could have easily have pushed that price below £5,000 had I asked for a discount in the online chat. There are much more developed PhD mills out there. Some show understanding of the contract cheating PhD level market. One PhD mill, for example, splits its services to match the stages of the PhD journey where a student might want to hire support. This includes everything from help with the initial application and proposal, through to chapter writing, to tutorials and mentoring for the final viva. It also claims to offer a premium service of publishable level work, produced in collaboration with an academic expert. For that level of service, enough to build the credentials for an academic job, the 75,000 word thesis would work out at £22,500. As my research investigating academic writers has shown, many essay mills find low priced writers and just act as an intermediary. Such budget price writers do exist at PhD level, even if they are harder to find. Presumably, some writers relish the intellectual challenge of completing advanced research as opposed to just writing basic essays. And, you can buy a custom written PhD thesis much cheaper. A report in the Indian media has shown that an original PhD thesis can be purchased in India for 50,000 Indian rupees (about £540), with payment in installments possible. The source claims that PhD writing offers like this one are not uncommon and that academics will moonlight as PhD writers. I also understand that similar services can often be found advertising in newspapers in India. PhD writing requests also occasionally appear on the major freelancing sites. 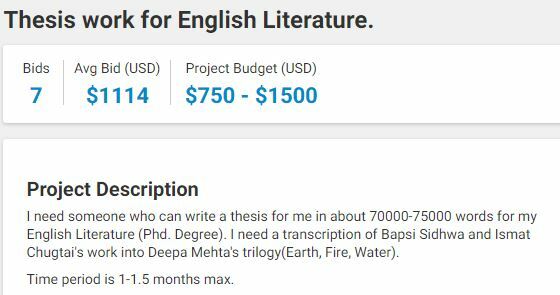 A (live at the time of writing) request for a PhD thesis on English Literature, from a buyer in Pakistan, saw 7 people, mostly from India, offering to complete this in six weeks at rates between £750 and £1,500 (with an average of £1114) for 75,000 words. 4 of the 7 bidders were from India. At face value, fulfilling the request in that time does not seem realistic for anyone, but this may be enough to secure a successful PhD completion in Pakistan. What About Buying A PhD Literature Review? Just as one of the PhD mills advertises its approach of completing a PhD thesis in collaborative stages, a student using a freelance site may also outsource their PhD thesis chapter by chapter. This may be because they feel able to complete part of the thesis themselves, but need help with some sections, or they may use it as an opportunity to audition a writer to work with throughout the process. 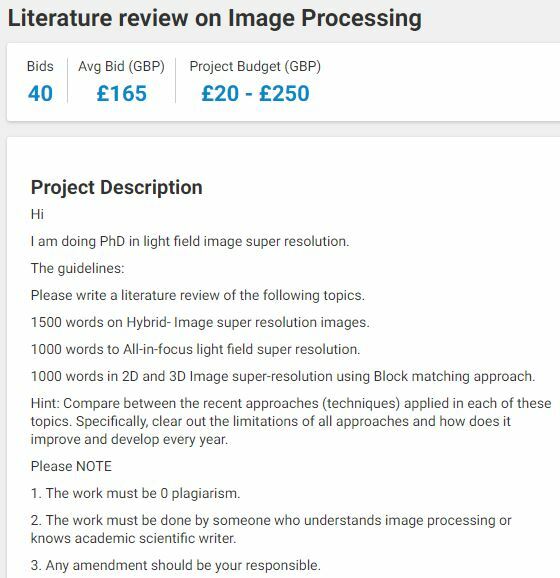 Here is another freelance site example, taking bids, with 40 people from around the world offering to complete a 3,500 word literature review for a PhD thesis. The person making the request states that they are in the UK (this information is mostly reliable as the requester is verified). They are also pricing in pounds, which is not common for people outside the UK. They have proposed a budget between £20 and £250, with offers received between £20 and £500. The mean (average) offer is at £165 (which would be about £47 per 1000 words – when I looked at essay pricing, I found lots of people willing to work for £7.50 for 1000 words). Perhaps a better measure is the mode, where 17 offers are at £150 (or £43 per 1000 words). This is a prolific group of bidders, with 4884 successfully completed jobs between them, with most coming from Kenya, Pakistan and India, but also including offers from the United Kingdom, United States, Australia and Canada. Just looking at the bidder profiles is interesting. I even found a graduate from a university I used to work at (but not someone I knew), using his MBA as a credential, completing assignments for students and even preparing fake reference letters for them (for which the going rate is around £20 per fake reference). It just goes to show that there are many ways to get a PhD if you’re creative about it. The area is very much understudied. Although I’ve provided other examples in previous academic papers and talks the amount of data available is small, so it is difficult to study this systematically. It does appear that PhDs are easier to achieve in some countries than others. We need employers to understand that not all qualifications are equal. I’ve often discussed how an MBA is often just seen as a stepping stone to a higher level leadership job. So, people will contract cheat here. In some places, it appears that a PhD is also considered like this. The good news is that, if academic integrity processes are suitably robust, simply buying a PhD level thesis in the UK should not be enough for its holder to be awarded a PhD title. The student still has a spoken viva exam to get through. Yes, students can train for this viva (and, as I’ve shown, there are services offering to prepare them), but here examiners need to have the confidence to fail the candidate if they do not have the in-depth knowledge and understanding that is required. It all comes down to the academic integrity of the supervisory team and examiners, along with the institutional process this sits within. And getting the right student, with the motivation and ability to complete a PhD is important too. PhD students most certainly have a role to play in preserving academic integrity. That companies and individuals are helping students to cheat in exams is something that higher education should be concerned about. This is not just small time business. Exam cheating is an entire industry. In a keynote presentation I gave at the Higher Education Quality Network conference, themed Assessment, Integrity, Review and held in Melbourne, Australia, I explored the issues surrounding exam cheating and the integrity of future examinations. This is a real issue, particularly where assessment by examination is being considered as a response to plagiarism and contract cheating. There is, however, also good practice than can be gained from how exams are conducted in a professional environment. So much exam cheating is supported by technology that is easily concealed. Supplying that technology is big business. It is more useful to think about alternative ways to use examinations as part of the assessment process than to try to simply react to the ever changing technology game.